Disclosure: This is a sponsored post written by me on behalf of Sposie Booster Pads, the number one brand in diaper doublers. All opinions are entirely my own. Road Trips with babies and toddlers are never easy. Mainly because they’re pretty unpredictable. You can never really tell when they’ll sleep, cry, need a change of clothes, etc. 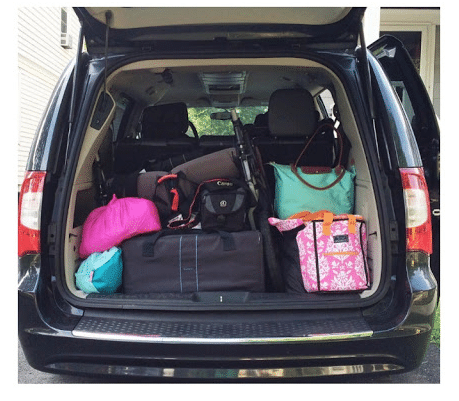 With a baby or toddler in tow, it’s best to over prepare if you want a successful road trip. 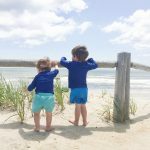 We’ve been road tripping with babies for almost 9 years now and while it never gets easier, I have found some things that work and some that don’t. 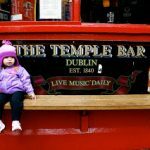 So today I’m sharing some of our Road Trip Tips with a Baby or Toddler. 1. When you pack the diaper bag put in how ever many “extra outfits” you think they’ll need and then double it. 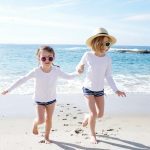 Maybe you won’t need one the whole time and maybe you’ll need 5 but instead of unpacking a suitcase for more outfits, have them at the ready. 2. Don’t schedule around their sleep schedule: I’ve found you can’t really tell when a baby or toddler will sleep in the car. One time we left at their bedtime for a 6 hour trip (one was 6 months and one was 2). They always went to be around 6/6:30 so we figured we’d get in a midnight but at least we’d have a quiet ride…. not so much. They stayed awake the WHOLE time!! Then we’ve had times were we drive mid day and they sleep the whole trip. Plan around traffic times and when you like to drive. The sleeping will either happen or not happen but don’t plan around it! 4. Start the drive on a full belly: For a baby a full belly means a happy baby and hopefully one that will then rest. 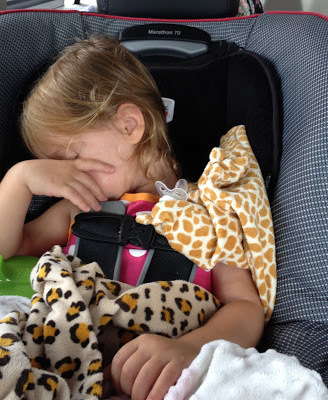 For a toddler, I have found that an empty belly means car sickness. A few times we tried to leave as soon as they woke to make our first stop breakfast to get out of the car and stretch: not a good idea. We soon discovered that meant carsick kids. 5. Music and DVDs from the Library for variety: We head to the library before a road trip and stock up on music cds and DVDs that they’ve never seen/heard before. This helps keep them more entertained and less bored. 6. Under prepare on snacks: I know I said to over prepare, but with snacks we like to make it a novelty to let little ones pick a snack when we stop. For some reasons pretzels from a snack shop are way more exciting then pretzels from mom. Of course have some packed but leaving some snacks/meals for them to choose breaks up the drive. 7. Mid Trip Entertainment: I found my best toddler “travel toy” at a rest stop….and it was free. Drink Trays make great toy trays. Toys then don’t fall out of their laps and they can make them into a fun little wonderland for their dinosaurs and animals. This is an old photo of a drink tray that my daughter loved so much she wanted to keep and paint for the next trip! 8. Bring paper towels, wipes and a few small trash bags: You never know what messes you’ll be cleaning! Also, we’ve found filling a small trash bag each time we stop makes for less of a messy car at the end of the road trip. 9. 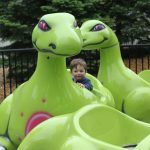 Seek out rest stops with a park or play area: It’s really hard for babies and toddlers to get out at a rest stop and not be able to crawl around and run around. 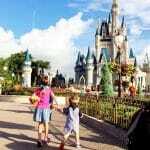 Seek out spots to stop that have a park, playground or indoor play area. I’ve found that while sitting in a carseat for a long road trip coupled with drinking bottles and water while in their carseat leads to leaking diapers. I can’t tell you how many times over the years we’ve taken a soaked babe out of the carseat during a road trip. It means a change of clothes and worse if they’ve wet the carseat when you still have hours to go where they need to sit in the seat. 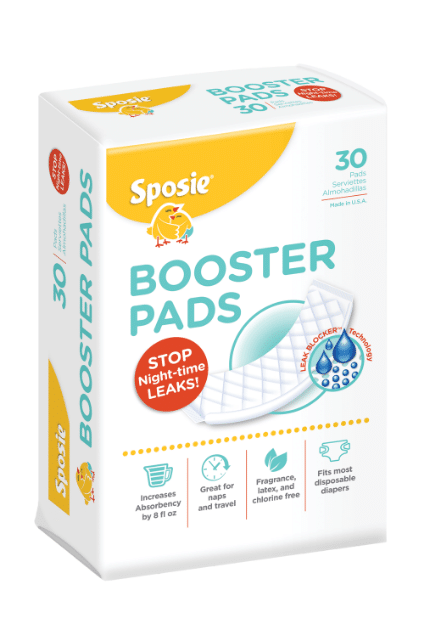 This is why Sposie got me thinking about writing this post: they are diaper booster pads. I recently tried them with Miles and they’re awesome. I wish I had them with all of my kids, especially when we traveled. I’ve used with Miles on road trips and for overnight. If you’re not familiar with Sposie, they are super-absorbant diaper inserts that fit inside all major diaper brands. They are made in the USA and are fragrance, latex and chlorine free. There’s a really soft microfiber top layer. Sposie boosters wick away moisture from baby’s skin to create a stay-dry barrier to reduce diaper rash and irritation. You simply place the pad inside the diaper. They hold a lot of liquid and really help keep babies and toddler dry. THey’re designed for both boys and girls. I’ve even used inside a pull up for overnight. To find Sposie Diaper Doubles, click here to find a retailer near you (I ordered from Walmart.com). 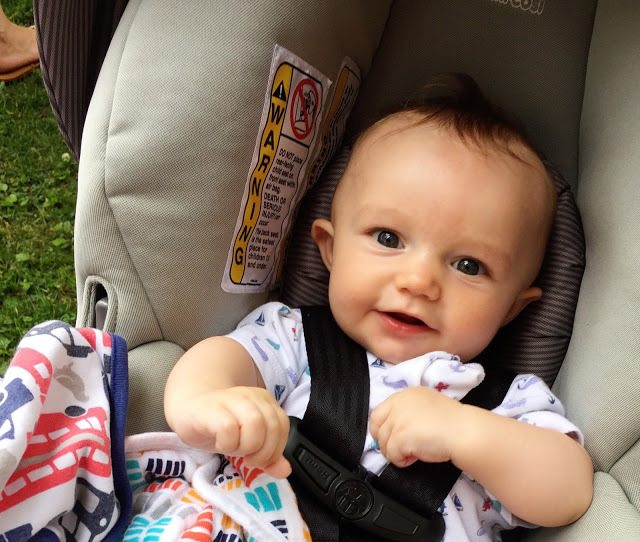 I’m not suggesting you don’t change your baby on a road trip, I just know from experience sitting in a carseat and drinking fluids has often led to lots of leaks for my kids. Also if it’s a long road trip, they will be sleeping for many of the driving hours and if they’re prone to leaks in the crib (mine are!) they will likely have the same problem in the car. 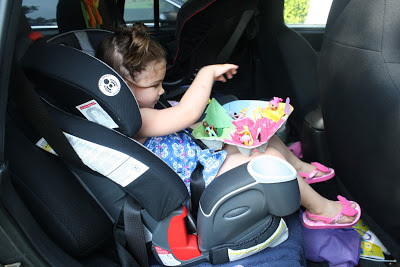 You can easily switch crib sheets but not easily clean a carseat mid road trip! 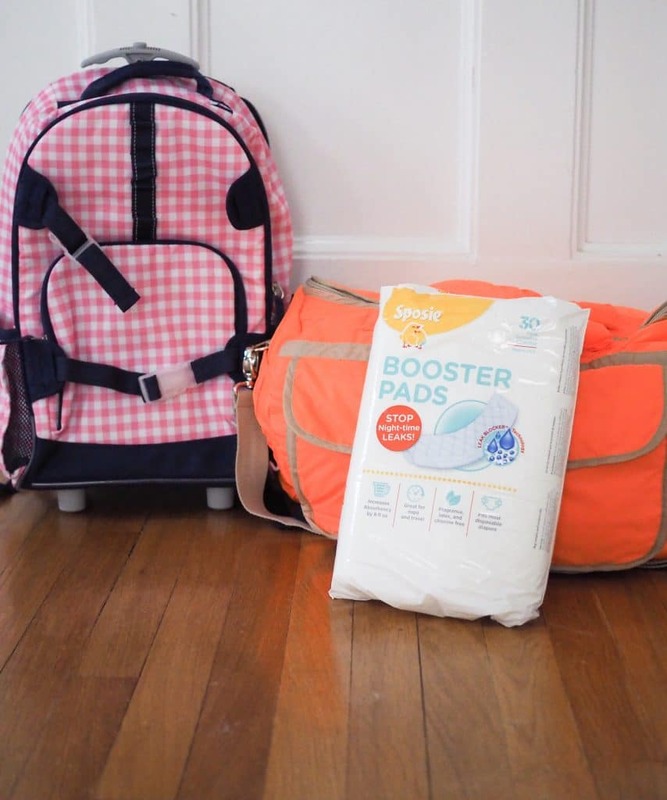 Sposie diaper booster pads are also great to bring on a road trip because they make any diaper “overnight diapers” once you get to your destination. 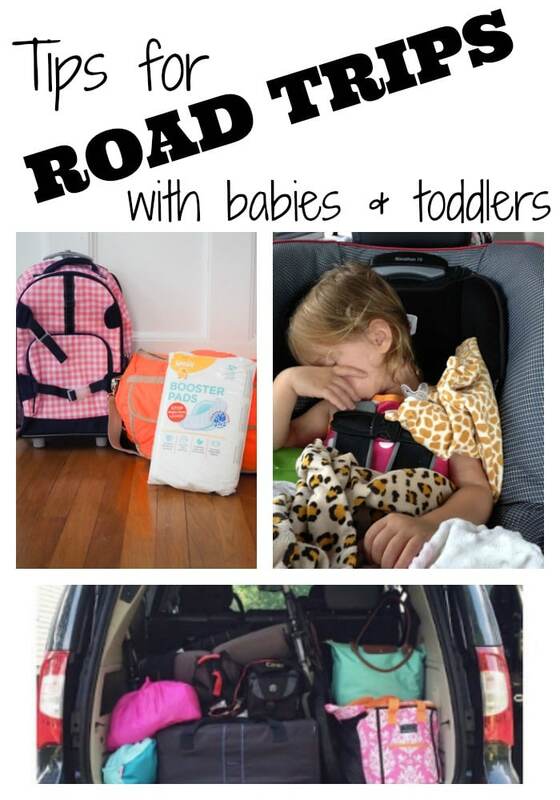 Good luck with your next road trip and I hope these tips help you if you’ll have a baby or toddler in tow!